Elegance with a twist! 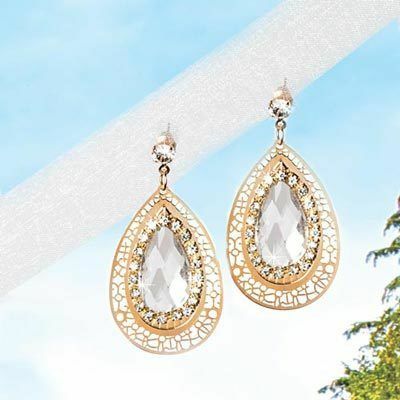 The simplicity of a clear, faceted stone works beautifully with the opulence of the ornate gold-tone filigree and abundance of white rhinestones for a look that is pure glamour… with an added shot of dazzling shimmer and bling! Simply amazing when the light hits all those stones—the glimmering shower of sparkles really draws attention. These Exotic Teardrop Earrings are perfect for parties or evenings out on the town. Post backs. 2"l. Hurry! Quantities are limited!